Like planting cocoa trees, it has a very long gestation period. Allow these Asene youngstars to blend more and begin to see the wonders of their performance. I am neither a fan of ARSENAL or for anyone except individual players in any team in England and Europe. But when Arsenal plays, they are wonders to behold. The problem mainly is beginning well but falttering mid-way into the league when others byepass them and win the trophy and leave them empty handed. It may payoff sooner than expected if we have patience with them and they are not sold at the time much is anticipated. Good luck, dear A. Wenger, Prof. Dr. Chief. Football. Arsene Wenger is a GENIUS. He has given us everything as a modern club, but his influence transcends Arsenal football club. He changed the English game by bringing in modern scientific methods to replace the stone age methods of football in England. He showed a foreign Manager can succeed in England and others have followed his footsteps. The stretch exercises, dietary plans he brought to England are now the norm. He build the ultra modern training facility at London Colney, this is the mother of all training complexes in England. I can go on and on. We built a new stadium on his transfer genius, the players he brought in for next to nothing like Vieira, Henry, Pires, Llungberg etc. etc. helped put us in a position both on and off the pitch to pay £140m cash we needed for the land at Asburton Grove and persuade the banks to build the stadium project. He had a grand plan to offset the lack of cashflow the stadium project will create for the first team. He went looking for the best young talent all around the world, whilst developing Arsenal's youth Academy at Hale End. He gave the young players a chance in the Carling Cup and gradually blooded them in the senior team. The likes of ManU and Chelski have now gone looking for their Cesc but they are too late. Wenger was once again a pioneer. Today, Arsenal boast some of the best youth foreign and English talent. Wenger net surplus in terms of players dealings in unique in football, no manager having spent that long at any football club can boast of a surplus in transfer dealing of players. We may have not won a thing in 4 years, we have come real close in the league and Champions League. Wenger's grand plan is now obvious to his arch critics but they can only marvel grudgingly at his vision. Where are those calls for a defensive midfielder? Where are those calls for Adebayor's replacement? They see Song and Van Persie, they realise they got it wrong, whilst Wenger got it right. They will moan if he does not win silverware but they know they will be stupid not to wait a little longer. We are almost there, Gooners, our time is here again. I feel alot more confident this season with the strength, actitude and most importantly the swaga being exhibited by the Arsenal players, my only fear is- would Arsenal be given a fair officiating? wi th a little bit of luck finally this could be the year,am a firm believer in arsene wenger football policy,in africa you don,t have to go to market with bag full of money to cook the best meal as we say,arsene is putting right mixture together. i'm a big fan of Man U but i have to admid that Wenger is a genius coach. he is the best in term of using and developing football player. his poor record in trophy is because of lacking money, if Arsenal still has Aderbayor and Flamini... they would be the most formidable. We can argue that Wenger's style of football is working wonders but everytime I look at the team, i realise that the future of modern football is now! This current arsenal team is simply strong becuase of the acquisition of experienced players like Vermaleen and Arshavin. If no trophy is won this season, I am sure Cesc will leave and then the rebuilding starts all over again. The Arsenal groupies are you serious? Mad scientist or Genius or not he is brilliant, the best manager on the planet, this is our year (ask the spud) its a matter of destine. My bet for Arsenal as the Premier Champion for 2010, they are doing a great work and I hope that beauty will prevail over the results scheme of teams such as Chelsea and Man U.
Mr. Thomas there should something we should all amit which is the man is a genius, he's great at discovering new talents and getting the best out of them, and now they look very strong for breaking MANUTD and CHELSEA's ties on the premier league trophy, but there is one thing can a team soo young last a whole season like this with no backbone of experience of wisdom, i mean look at UNITED giggs is what 34 and i believe this season till now with the way he's playin is his best at all, withou forgetting the restless scholes and neville and co. And what about chelsea probably the oldest team in the league, with few players under the age of 25, which shows that experience is the key u need somebody to lift the team im not denying that fabregas isnt a good captain no, he's a great one but u need someone on the pitch who's been around for some time. Thank you. Wenger's genius is not hard to see. He really and thoroughly is a superb manager. He's going through a tough period in which he's kept his team competing at the very top but he's not won a trophy in 4 years. Alex Thomas wonders whether it's the efficacy of Arsenal's beautiful attacking football that have kept trophies away. I think the opposite is clearly the case. Arsenal's football guarantees the team a certain number of points every season. They will tear teams apart. Furthermore, Wenger has always played the exact same attacking football, and with it created one of the most remarkable teams in sports in "the invincibles". It would make no sense to think attacking football has suddenly become incapable of winning trophies. Afterall, the teams that have dominated recently; Man United and Barcelona, are very offensive teams. Why Arsenal have not won trophies in the last 4 years is that his old squad reached the end of its cycle in 2005. They were old as a squad, and Wenger had to rebuild. At the same time, Arsenal were building a new stadium. The building of the stadium meant Arsenal did not have the financial means (at least £200M was needed) to buy a new squad at a time when Chelsea spent some £400M on players they mostly played multiples of the going market rate for. Wenger and Arsenal had no choice whatsoever to rebuild by finding and developing the best kids they could find in the world. You can buy but not build a squad overnight. At the same time, Chelsea, Liverpool and Man United have had some of their best squads in decades, or of all times (as the case may be). Wenger's current Arsenal squad is bursting with talent, and having come close to winning trophies having played major finals and semi-finals, and having led the league for 3/4ths of the season in 07/08, there is every reason to be sure they'll win something soon. When Arsenal win a trophy it will be a game-changer in football. The football establishment knows it. i dont just like the guy.He is not ambitious. Let's look at Pep Guardiola at Barcelona. This man, equally obsessed with playing beautiful won the Treble his first year. The headline of this story is nonsensical. Wegner's problem isn't his style of play rather it is his transfer policy and the lack of experienced players. However, I believe this might be Arsenal's year... the not so dark horse of the PL. All of u guys are dreamers... sorry to say that but facts speak for themself: 4 years=0 so i don't know what you folks are talking about!?! Sir Alex Ferguson, Mourhino, Cappello, Arigo Sacchi... these are the Einstein, Mozart, Beethoven, Van Goeg... and what you can call genius!!!!!!! Your Professor is more Mr. Arsene Lupin than anything else!!! Football is about playing and winning trophies and not about philosophy! Confort yourselves if you want but no politics please! Hope is for Mr Obama and us who believe in a better world without war, famine, desease... Football is football where there is not degree for what you have achieved but what you've got! Whatever, those young gunners are a delight to watch anytime anyday. And believe me this is the season for trophies. I do not believe Wenger is a genius(atleast not yet). Geniuses achieve success through innovative, unique ways no one has tried or thought of, though I agree Wenger has a unique style but he hasn't succeeded. Success in football is measured by winning trophies not by playing the most beautiful football or having teenagers running round a field trying to look handsome. History will only remember those who win not those who nearly did. As they say in my part of the world "nearly does not kill a bird". I'm guilty of dubbing Wenger a lab scientist on a couple of occasions when he seemed to stick to his guns even in the face of defeat, due to his 'lack of desperation'. The Carling Cup final against a 1st string Chelsea team a few years ago comes to mind here. Over time, though, I've come to realise that the Prof is actually a great model for the coaching profession and for football , at large. Nigerians, fans of Arsenal and those of the other English clubs, all love Arsenal. The difference is in the expression. Viva Arsene! Viva Arsenal!! 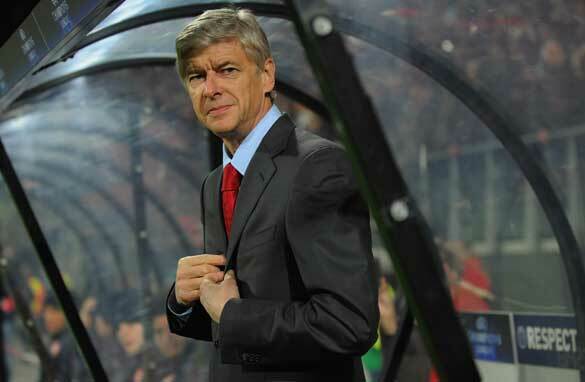 Hope Arsenal will soon win the Champion's League so Arsène can be the French national team coach. Just look at AGooner's post, it says all you need to know about this 'topic', media and society at large. Arsenal habitually play attractive football pre Christmas, but when the Winter weather strikes and the pitches get heavier their free flowing passing game gets bogged down and they win nothing. I love Wenger because of the intelligence and class he brings to the EPL, but I just don't see the Gunners winning anything substantial this season. They might have a shout in the FA Cup, because that's a lottery, but I don't believe they have the depth of quality to win the Prem or the Champions League when there are star-studded teams like Chelsea and Barca around who can win pretty or win ugly because they have the talent and experience to adapt . Don't get me wrong, Arsenal have some great players in Arshavin, Van Persie, Fabregas and Vermaelen, and I don't share Alan Hansen's view that "you win nothing with kids." But I have to say the Gunners are a bit like Liverpool, who have nothing in reserve if Stevie G, Carragher, Mascerano or Torres go missing. I love watching the Gunners right now, but I have a sneaking suspicion they flatter to deceive. Wenger is the man , just look at the games you know he has it all worked out . Arsenal are playing exciting football and winning the hearts of many. It would be nice to see them lifting some trophies in the ongoing football season. Best wishes to the Gunners and to their legion of admirers. Arsene is a God sent, we should all pray that God strenghten him to steer the wheeel of Arsenal for as many years as possible. He groomed and will never buy trophy like others. 32M on a defender, 25m on a mildfieder who bearly played a season and then 30 million on a striker from the north london who is yer to score 5 goals like Vamenen, hun, the class is there, common, Baba Wenger, we love you. So hasn't Arsene won trophies before? The only thing he is doing wrong in my opinion is letting his players go every season and letting a youngster take there place. Other than that he is a true Genius and soon hopefully he will show that money doesn't equal success. This season looks promising but we were on course in 2007-08 season and faded away so im keeping my fingers crossed. Gooner4Life!!!!!! There is no team in England like Arsenal.So,people should please make themselves very busy with something else.Arsenal plays the best free flowing football on earth,and it's like there game came from heaven.The big Prof is 100% in charge and i commend him for his policy.Gunners For Ever.